MobileInfocenter has launched a new mobile and desktop eco news service. EcoTopical showcases the latest stories and headlines from the environmental news ecosystem on the web or your mobile device. 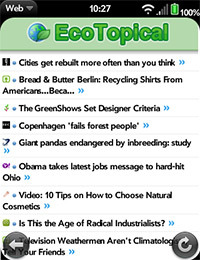 EcoTopical melds more than 50 of the web's most popular eco news sources in a real time, news stream style layout. Categories include green news, climate, design, ecology, lifestyle, polices, tech and transportation. The site offers ecology enthusiasts an easy to follow, scannable format for staying on top of all the days eco topics. "The planet doesn't stop spinning and neither does the stream of news." comments Ryan Kairer, EcoTopical's developer, "EcoTopical is a new aggregator which provides an at a glance look at the latest green news." EcoTopical is a free service available now on the web or specially formatted for your mobile device at: EcoTopical.com. Is it Really NEWS or just Fanboyism? ... I would probably pay for it. But, if it's just more world government propaganda seen thru jade colored glasses, I can get plenty of that on our State controlled media outlets. Another app for WebOS tho. Woohoo. RE: Is it Really NEWS or just Fanboyism? Regardless of how you feel about global warming, one thing you cannot ignore or deny is ocean acidification. It is directly caused by higher concentrations of CO2 in our atmosphere by the burning of fossil fuels. Read up on it. There is no denying this one little side effect of oil, gas, and coal. Even if you don't believe any of that, you should still support getting off of fossil fuels. For the amount of energy that we consume as a nation, we don't have the reserves to last past ten years with our oil and gas supplies, regardless of what you hear in TV commercial propaganda. Look at the BP Statistical review. They show known reserves and the R/P ratio (reserves/production), the most important number. The world as a whole has 40 years until oil is uneconomical, 60 years until gas is uneconomical, and 250 years until coal is uneconomical. In our lifetime, we will see the end of the oil age. America should be on the bleeding edge of research and development of new fuels, storage, and processes. Regardless of your political affiliation, you need to support this. It affects the economy, national security, our daily lives, and the future of the human race. You can't afford to put your head in the sand with this. This innovative offering can function any where there is electricity. E-motion energy can power we-com virtual wallets. We still need electricity for infrastructure. How can we-com virtual wallet help pay for North American choices? we-com virtual wallets can even enhance economies in zero gravity. It's good to know others are thinking of future commerce solutions too. We-com virtual wallet has already been designed all that is left is to build the prototype so one can see the words in action. Perhaps PDAs will interact with we-com virtual wallets. There are reasons why having all in one solution is not always the best choice. Two can back up one another. With just one if something goes wrong there is no back up. Putting all the eggs in one basket risks breaking all the eggs if the basket falls. Two choices are better than one. Could a we-com virtual wallet help pay for e-motion? Would such interactive choices offer a complete package for economic and physical well being? Plan-et is going to be very busy creating jobs with income that can afford such choices. stop spamming the site. i suggest that Ryan BAN you until such time that you record and post a 5 minute video on youtube where you face the camera and verbalize your manifesto. i want to see what kind of absolute nut job you are. :-(lol) I've been here since 2000 your the only one with such issues. Just ignore my thoughts. You'll be fine carry on with your choices leave me to mine. .
your endless off-topic spam pollutes the site and pushes all of the on-topic comments off of the comment page. nobody wants to wade through it all. i've defended you before but now i've had enough because you're taking advantage. Your free to have your opinions as am i. No need to ban people unless they are advocating violence or harm. Insults are a part of freedom of speech everything that is said has consequences. Again i suggest you ignore my thought that is your right and leave me to my rights. If Ryan wants to ban me that is his choice and should not be influenced by one person that came along a few years later. stay on topic and stop spamming. Pick a tropic store it as your book mark and stop wasting Ryan's time with your complaints. If you have something to say about Palm, PDAs, WebOS, then say it. If you want to rant about things that have nothing to do with Palminfocenter, then go **** yourself. Take care. Palminfocenter has no affiliation to Palm. Ryan has added eco content to his site it is his space that he has graciously shared get along and ignore my thoughts and you can focus on Palm. There is synergy between PDAs and we-com virtual wallet. Try to contribute more than insults. Others have prior to you. e_tellurian, we enjoy your wisdom when it is directly relevant to the article and/or discussion at hand. However, excessive commenting, nonsensical, off-topic or unrelated comments will be removed. Repeated deletions and failure to stay on topic may result in another "time out" for your account. Please try to keep your commentary relevant to Palm Inc. or the mobile computing industry. Thanks. The tech industry runs on electricity. Thanks for bringing this to our attention. Solar energy can offer sustainable peace by offering alternative industries to training terrorists and growing and selling opium. The opium revenue is used to fund those killing our service men and women. A solar industry in the desert can offer better choices. can yo also UP the number of comments visible on the "comment board" on the PC site version? i click comment board and it doesn't go back far enough and give me enough comments for follow up. of course E-T blew up the comments but it could still using an "upping" regardless if poissble. With more people choosing mobile electronic devices energy consumption goes up. With e-motion, energy can be created voluntarily reducing the strain on existing energy grids. Sustainable energy is important to the technology industry. It is important for future we-com applications. With more people helping by adding devices to a we-com industry energy will be needed to assure such choices will have sufficient electricity that is eco friendly. E-motion can assure there is energy on demand while adding energy to the grid by voluntarily seeking solutions that will produce energy for new industries such as we-com. Innovative eco friendly energy solutions will move the day forward. North America has a good history of developing innovative solutions to address needs and wants of our shared planet. Developed nations have learned from the past and should not shoulder the entire cost of cleaning up our eco system. Developing nations should learn from the past and look to eco friendly energy solutions that will enhance the shelf life of oil. We still need oil for much of economy. We must prepare for the day oil is no longer available. The Middle East oil has helped to build North America we can continue to trade in energy just the energy will not be oil in the future. Solar in the desert can help make other energy such as harnessing electricity for automobiles. Can off topic E-tellurian SPAMMING posts be deleted? He used to be funny, but now that the comments at Palminfocenter have pretty much dried up to a trickle, that E-diot's posts are making a mockery of the site. Time for some housecleaning at PIC and deSPAMMING should the first order of business. To all of the lurkers out there: its time for you to step up and start posting your thoughts about Palm, WebOS, etc. to Palminfocenter. The oldtimers have gotten burnt out from carrying the posting load for so long and if some fresh posters don't step forward soon, this site will be comletely dead. PalmStation died when the posters and the site admin lost interest. Don't let PIC die as well. Get off your asses and keep the discussion here lively! RE: Can off topic E-tellurian SPAMMING posts be deleted? Fake-etc - aren't you just describing natural selection following its expected course? The death of Palm cases the death of PIC? Yes J., Palm is going the way of the dodo. But despite the implosion at Palm, the community can still survive - for a while - beyond the company's demise. The Palm platform, developers and users deserved a company that valued those individuals better than Palm did. Palm got lucky in that they chose a clever OS and packaged an appealing hardware design before most competitors were able to market similar products. What really created the Palm phenomenon though was the developers who came up with thousands of useful applications that pushed the crude hardware to a level that Palm had never even considered. I realize you hate all things Palm, but many of us here use PalmOS devices daily either because PalmOS serves our needs or out of nostalgia. The dwindling PalmOS user community has become far too fragmented. Palminfocenter should be kept alive as a focal point for remaining PalmOS users.